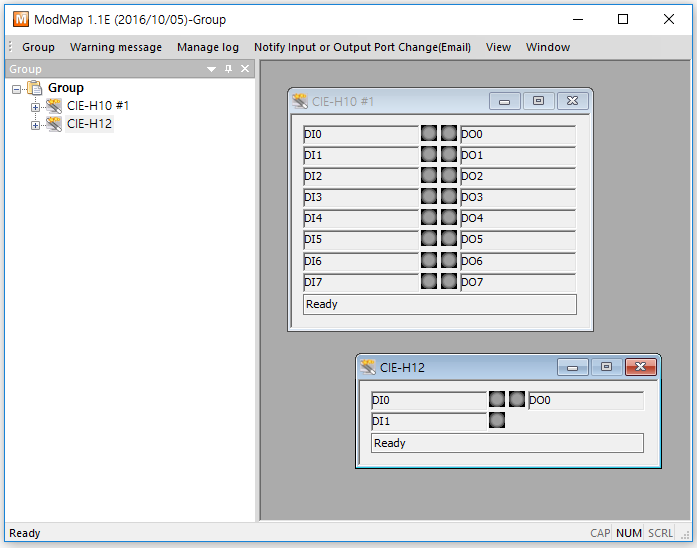 ModMap is a Windows software for management of I/O controllers. The followings are what ModMap does. - Modmap manages multiple I/O devices simultaneously. - This application can monitor digital inputs and outputs of Modbus/TCP devices such as CIE-M10/CIE-H10/EZI-10. ModMap has features like the below. - Easy management of multiple remote I/O devices. - Efficient handling a lot of devices by using grouping. - Backup and restore the setting as a binary file. - Free download for anyone who uses ezTCP for free. History - Input ports state change notification added. - Time settings for notification functions added. - Bug fixes and performance improvements. - User login added. - Input ports state change sound notification added.